Plantains look like large bananas, but they taste starchy rather than sweet. They can be eaten green (unripe) or yellow (ripe). 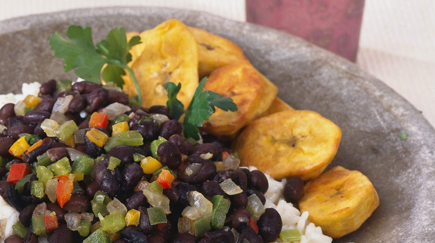 This simple recipe calls for ripe yellow plantains. You can serve them as a side dish with bean-based entrees and vegetable soups and stews. Peel the plantains and slice them into 1/4-inch circles or diagonally into 1/4-inch slices. Heat the butter or oil in a large skillet. Add the plantains, arranging them in a single layer in the skillet. Fry on both sides until golden brown and hot, about 10 minutes total. Serve. Before frying, dip the plantain slices into flour or breadcrumbs. For a slightly sweet version, add 1 tablespoon brown sugar with the butter or oil in Step 2. Per serving: Calories 169 (From Fat 63); Fat 7g (Saturated 1g); Cholesterol 0mg; Sodium 4mg; Carbohydrate 29g (Dietary Fiber 2g); Protein 1g.